Mr. Sprinkles is a teddy bear, a child's plaything. Mr. Sprinkles has a missing button eye, and it makes him look like he's winking. It's not a friendly wink, no sir, not at all. Mr. Sprinkles looks like he's done something bad, something he doesn't want you to tell on him. Hell has come to the secluded, Kudzu-covered town of Eden Pointe, Georgia. 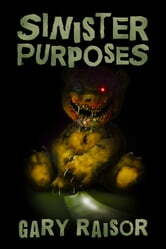 It slid in on a train late one night, bearing shadows of the damned, and the most unlikely of demons—a teddy bear—Mr. Sprinkles. The bear, monstrous as it is, works for something even more horrible. Something hungry that's marked the town for its own. Only a few people, including a drug-addicted priest, know what they're up against. As shadows gather in Eden Pointe, the death toll mounts. Burnings, decapitations, crucifixions, impalings, and the occasional premature burial. Each death brings the Hell train closer. Only problem is, its thunder can only be heard by a few troubled souls. The priest, along with his ex-marine uncle, both fighting their own private demons, have to decide just how far they will go to get their loved ones off the train. Demons are about to learn that when a man has nothing to lose, there's no telling how far he'll go. He might even go to Hell and back. Heavily re-worked, with a brand new novel leading off, this is a hefty collection of connected stories that form a unified, terrifying tale from Gary Raisor, the author of Less Than Human. This one is something special, folks! And now, it's even more special!